Federer has struggled since claiming his 16th Grand Slam singles title at the Australian Open in January. 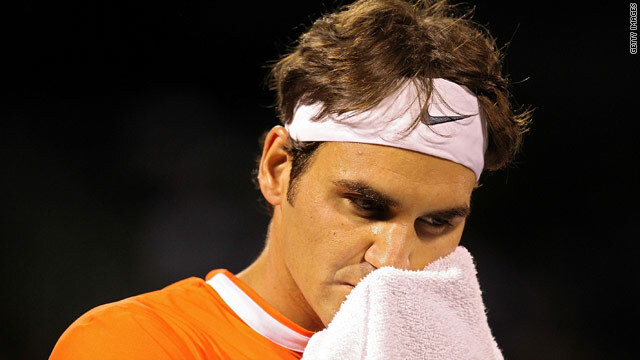 Roger Federer loses to Tomas Berdych at Sony Ericsson Open fourth round in Miami. Federer wastes a match point before losing deciding set on a tie-break. Venus Williams beats Agnieszka Radwanska to advance to women's semifinals. (CNN) -- Roger Federer suffered a surprise defeat to Czech Tomas Berdych in the fourth round of the Sony Ericsson Open in Miami. The Swiss top seed was a long way from his best as Berdych edged a tight battle 6-4 6-7 (3-7) 7-6 (8-6). Federer had a match point in the deciding tie-break but missed his chance with a wayward forehand, allowing Berdych to claim the victory three points later. Federer, who won the latest of his record 16 Grand Slam singles titles at the Australian Open in January, had only lost once to Berdych in nine previous meetings. "It's no secret I've struggled the last five matches I've played here in the States," Federer told the official ATP Tour Web site. "I'm definitely lacking timing. I don't know where that comes from because I played so nicely in Australia. So it's disappointing to not be able to back it up." They were joined in the quarterfinals by American Andy Roddick, who fought back from 4-1 down to defeat Germany's Benjamin Becker 7-6 (7-4) 6-3. Fourth seed Rafael Nadal beat fellow Spaniard and 15th seed David Ferrer 7-6 (7-5) 6-4 and will next face eighth seed Jo-Wilfried Tsonga, who trounced Juan Carlos Ferrero of Spain 6-2 6-2. Fifth seed Robin Soderling of Sweden progressed with a 6-0 6-7 (3-7) 6-2 victory over Chile's Fernando Gonzalez, while Mardy Fish of the U.S. was forced to retire while trailing 6-1 1-0 against 13th seed Mikhail Youzhny. In the women's tournament, Venus Williams advanced to the semi-finals with a 6-3 6-1 victory over Agnieszka Radwanska. She will face France's former Wimbledon finalist Marion Bartoli, who beat Yanina Wickmayer 6-4, 7-5. Williams, who had required three sets to defeat Daniela Hantuchova in the previous round, was delighted to have had an easier ride this time around. "Getting through a match like yesterday makes me more confident because it wasn't exactly my best game," she told the tournament's official Web site. "Today I was kind of eager to clean up my act. We had some really good rallies and really good points, but I just see me keep coming out on top, so of course I like that."